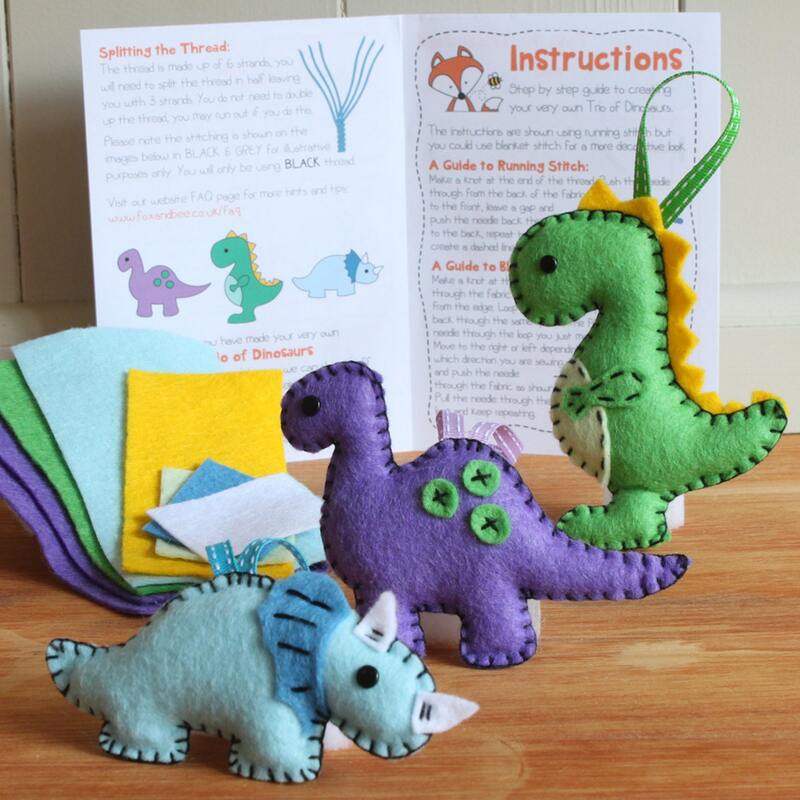 Fox & Bee’s Dinosaur Friends felt sewing kit is perfect for kids and adults of all ages and abilities – whether it’s your first time sewing or you’re an old hand, you’ll love making these felt dinosaur decorations. Simply type the name in the personalisation box that you wish to be printed on the front label - up to 12 characters. 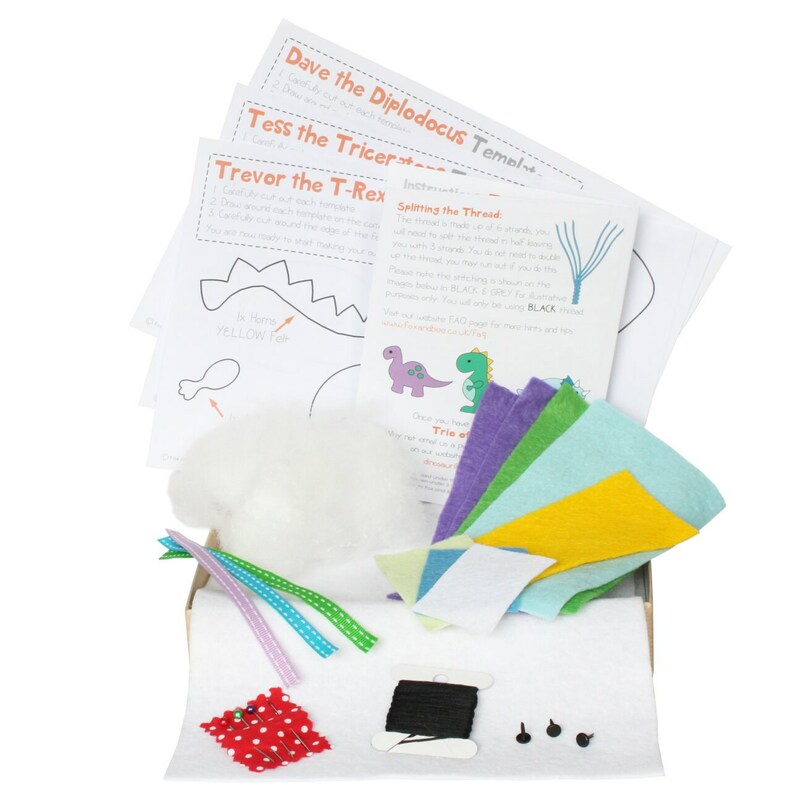 Perfect for decorating bedrooms and playrooms – the ‘Hangable’ range of felt sewing kits allow you to hang your finished decoration using the ribbon loop so you can show off your excellent crafting skills virtually anywhere! Great fun for adults too! 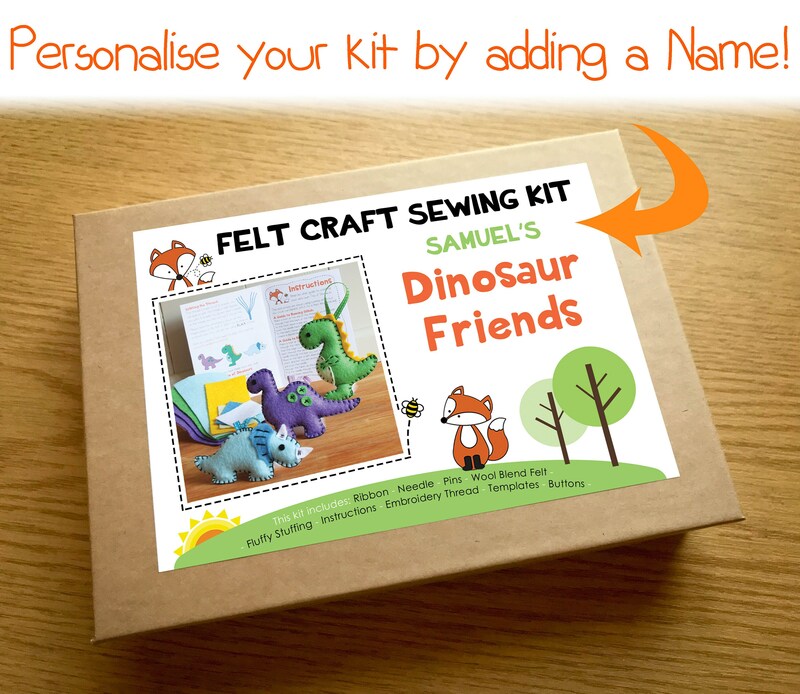 Fox & Bee felt sewing kits also make fantastic gifts – birthday presents, Christmas stocking fillers and for other occasions – and great for keeping busy during the holidays or as a present just for you. Recycled cardboard box that can be re-used. Recommended for ages eight and over – perfect for beginner to advanced crafters. Not suitable for children under 3 years old due to small pieces and sharp items. To be used under the direct supervision of an adult. Please note: this is a decoration, not a toy. Only the front label will be personalised (see images for examples). Please note, the name you provide will be printed EXACTLY as you write it, so please ensure the correct spelling as we cannot be held responsible for any mistakes. We will not print anything offensive. Due to the wool blend content of the felt, our products are not suitable for washing, by hand or machine. If you have creases in the felt you can iron them out before stitching begins on a very low heat setting. Alternatively place a cloth like a tea towel over the felt and iron over the top to avoid burning the felt.